Corporal Cosgrove and his police K-9 Axel visited campus on September 5 to demonstrate Axel's doggy duties. A student picked up a pen, thus marking her scent and Axel was able to sniff it out once it was hidden in the grass. 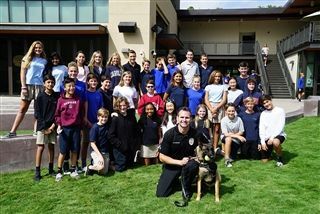 Students asked poignant questions about Axel's specialized work and enjoyed the Belgian Malinois' boundless energy.